From school classrooms to workplaces, to kitchens, and even living room spaces bulletin boards are an organizational staple. While shopping for a bulletin board to hang above my home office desk, I was shocked to discover how much this office essential can fetch from retailers. And if you happen to find one with embellishments or a frame? Forget it! Therefore, when I came across these 100% natural self-stick cork panels, I was more than thrilled! 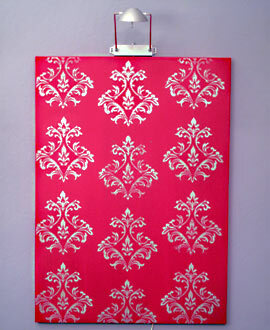 At $14 per pack of four 12"x12" panels, I simply could do no wrong! Since my bulletin board was going to take center stage on my office wall, I knew I didn't want it to be bland and boring. Therefore, why not make it into a piece of art? 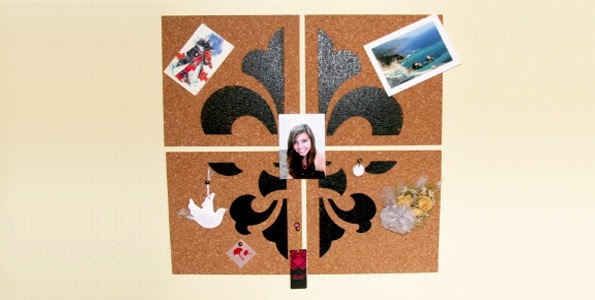 Surely, a Fleur De Lis accent would pull my office decor up a notch and make it a striking focal point. My artwork for this project can be downloaded from StencilItPretty Freebies section. 1. 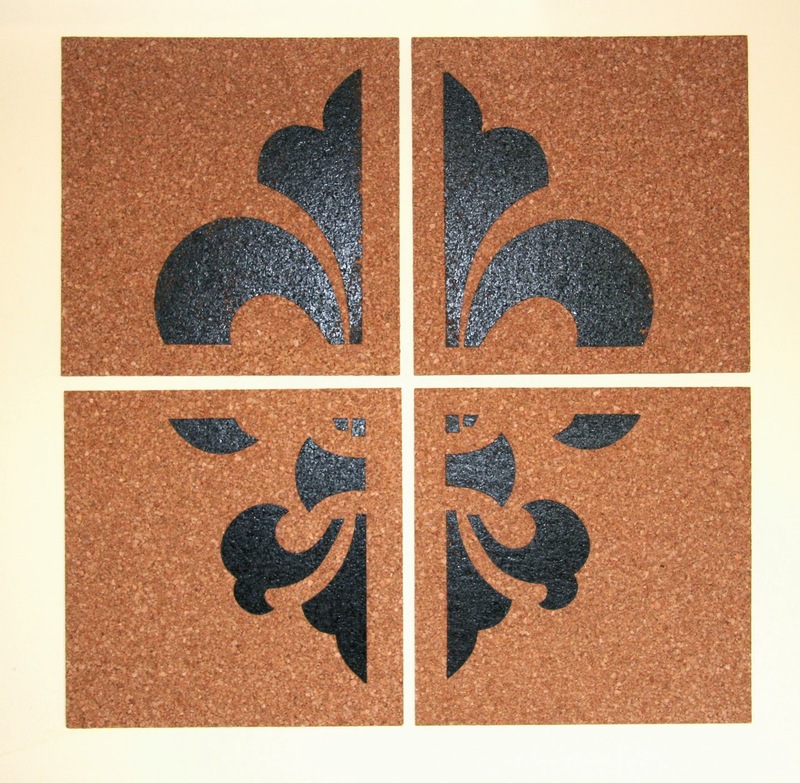 I started out by printing my design on 4 sheets of transparency (one segment of Fleur De Lis printed on transparency per cork panel). 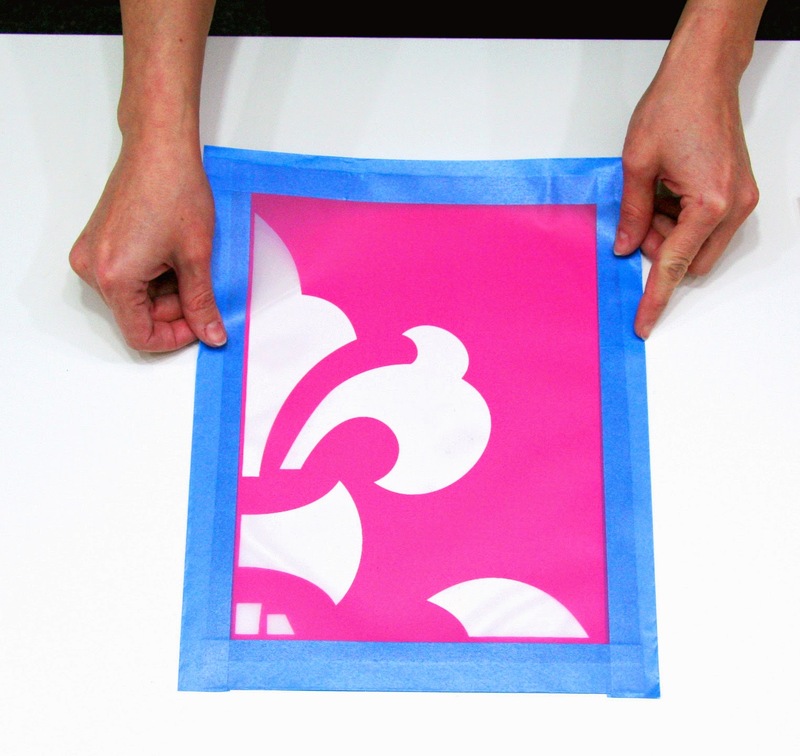 Transparency is included with StencilPro Starter Kit or you can purchase it separately: InkJet transparecy or LaserJet; alternatively transparency can be purchased from your local office supply store. 2. Following the manufacturer's instructions, I have made the StencilPro stencils by exposing each piece of artwork printed on transparency and sheet of StencilPro film to light, then washing the stencil using tap water and air drying. 3. 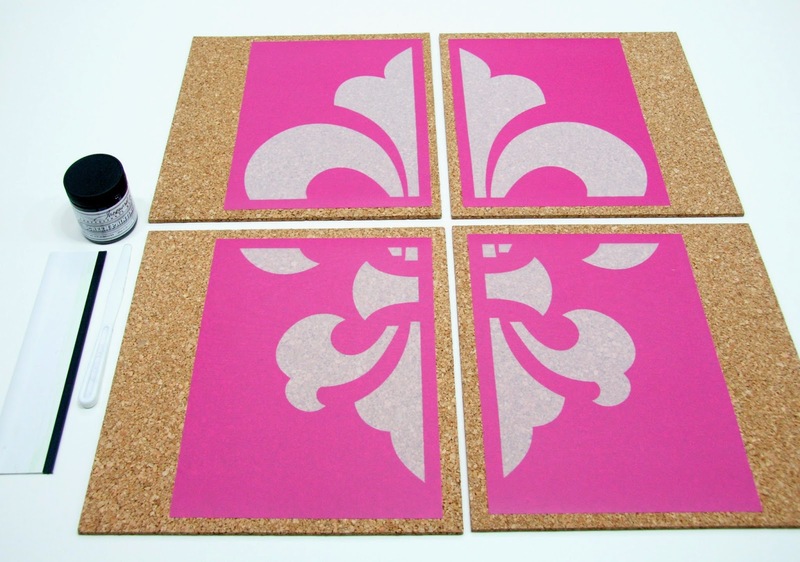 To help visualize the completed project, I laid out all four cork panels on the table and matched each segment of the Fleur De Lis stencil with each panel. 4. 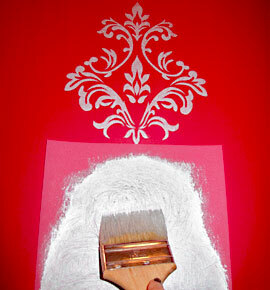 Then using painters tape, I taped all four sides of the StencilPro stencil. Tape made the stencil edges more rigid; it was also helpful in keeping the stencil firmly attached to the surface of the cork panel for printing. 5. Using a plastic palette knife, I put a generous bead of Jacquard paint onto the stencil (avoiding open parts of the design on the stencil), then spread it across the top of the stencil in a thin line. 6. Holding a squeegee at 45 degree angle, I printed the design onto the cork panel. 7. Following the same steps, I printed the rest of the cork panels. 8. After the paint has dried, I hung the cork panels using self adhesive strips (these come with the set) side by side for a uniform look. 9. 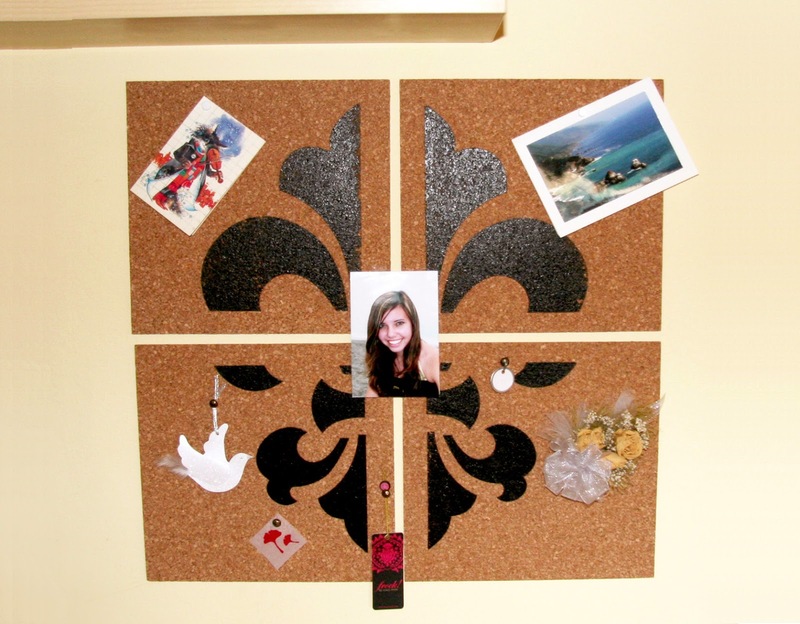 I used simple pushpins to attach mementos and reminders to make sure not to overwhelm the beautiful wall arrangemet. These blocks are super easy to make, and a fun idea for anyone who likes to decorate, perfect for mantel, bookshelf, or wall display. 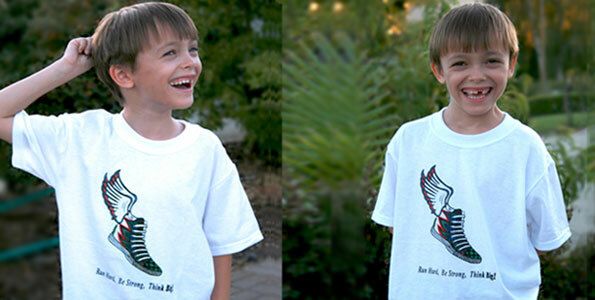 How about printing a hidden message or sweet little nothings for the one you love? If you happen to get inspired and make your own blocks, I would love to see your ideas! 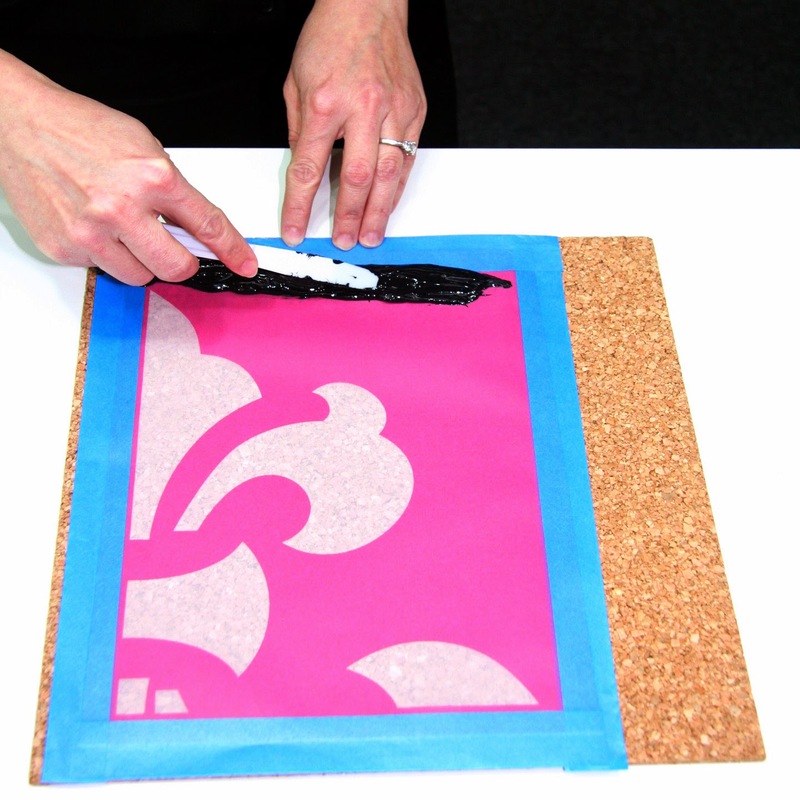 The full video of the Screen Printed Blocks of Fun DIY for you to enjoy! We worry about what a child will become tomorrow, yet we forget that he is someone today. Fifty years from now it will not matter what kind of car we drove, what kind of house we lived in, how much we had in our bank account, or what our clothes looked like. But the world may be a better place because we were important in the life of a child once. Of course, it is eminently reasonable that parents should want to protect their children. There is a certain sense of fragility that forces us to place that “Baby on board” sign in a window of our car or baste our children in anti-bacterial hand soaps and sanitizers. The prevailing opinion amongst adults is that our children are at risk. We ensure that they venture nowhere near the edge of the nest: you never know what danger might lie beyond its cozy, bubble-wrapped confines. We take it upon ourselves to protect our children’s innocence no matter what the cost, and sometimes this cost is too great. Of course we have a stake in their innocence; however, are we doing too much? I can already hear you say “You cannot be too careful”. Our “claim to protect” may actually be doing our children a greater disservice. Overwhelmed by parental panic, we over-regulate and squeeze the life out of anything fun. 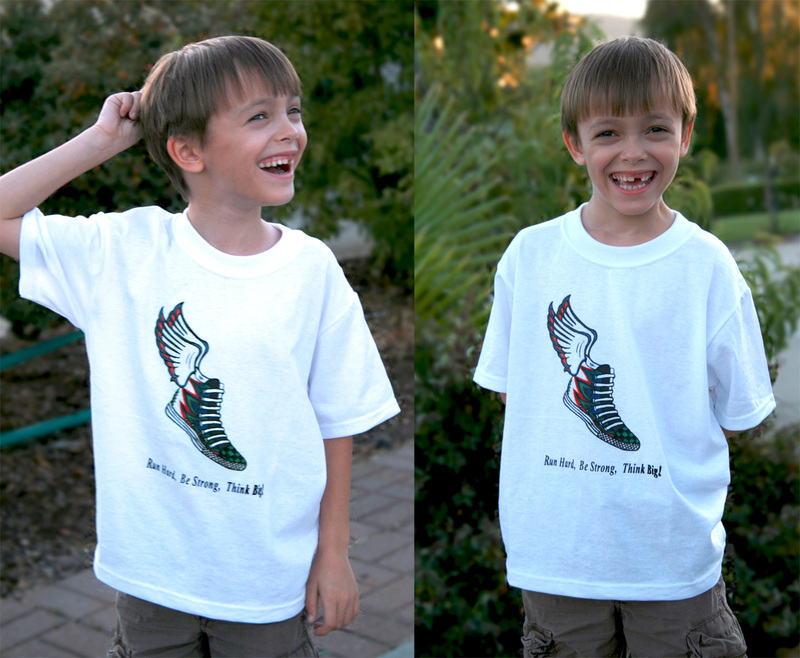 It is as if we give our children wings, and then we clip them before they even learn how to fly. It is amazing how inspirational kids can be. As parents, it is our responsibility to protect; however, it is even greater responsibility for us to love, accept, challenge, inspire, and guide our children with enthusiasm; and of course help them live what they learn. After all, we are here to give them roots and help them find their wings. Only then, the sky is the limit! 1. 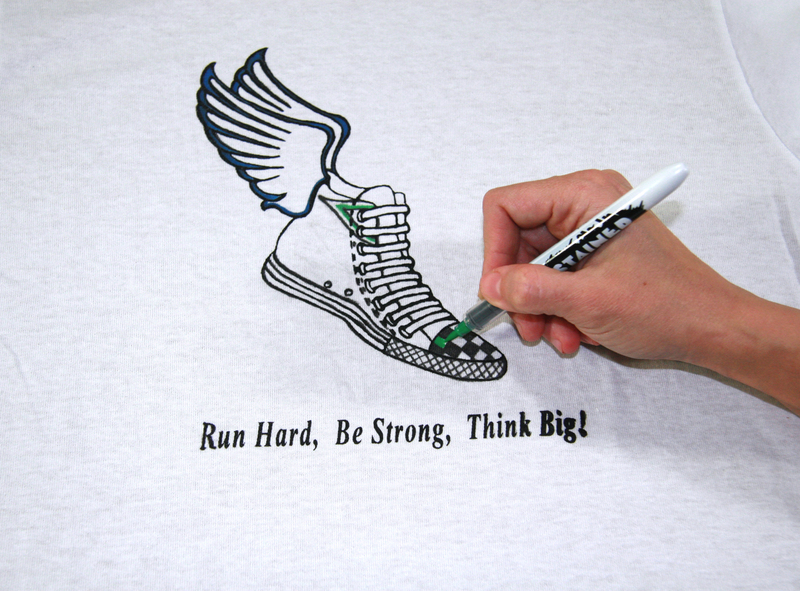 I started out by sketching my design on paper, then scanned it into my computer to "bolden" the lines, turn it into black and white (for PhotoShop users, I used "Threshhold" function), and add the inspirational quote "Run Hard, Be Strong, Think Big" by Percy Cerutty. 2. Once happy with my artwork, I printed it on a sheet of transparency. Transparency comes with PhotoEZ Starter Kit or you can purchase it separately: InkJet transparecy or LaserJet; alternatively transparency can be purchased from your local office supply store. 3. Following the manufacturer's instructions, I have made the PhotoEZ stencil by exposing artwork and sheet of PhotoEZ film to light, then washing the stencil using tap water and air drying. 4. 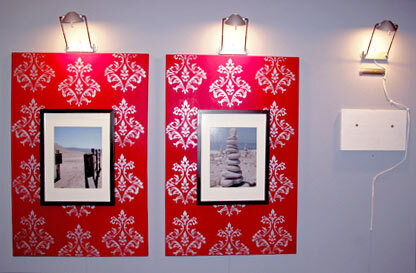 Then using painters tape, I mounted my PhotoEZ stencil onto plastic frame. 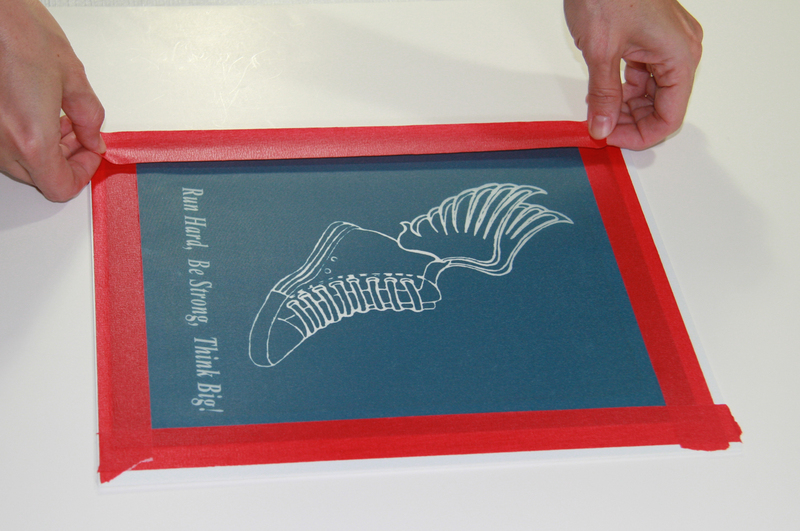 Frame helped to make the stencil rigid and easy to use for screen printing on fabric. 5. To protect t-shirt and prevent paint from bleeding through to the other side, I have inserted a piece of cardboard (I cut one out of an old shipping box I had). 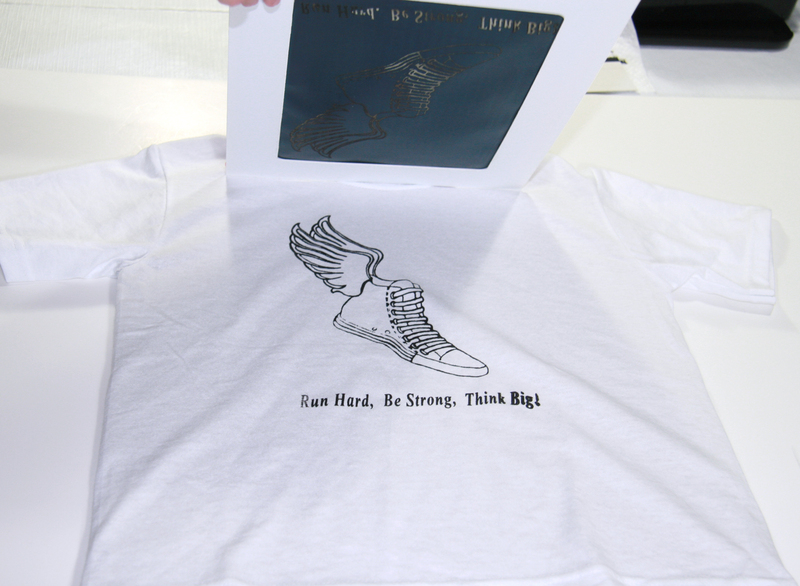 Eyeballing the positioning of the design on the t-shirt, I have placed the PhotoEZ stencil on top. Then using a plastic palette knife, I put a generous bead of Jacquard paint onto the stencil (avoiding open parts of the design on the stencil), then spread it across the top of the stencil in a thin line. 6. 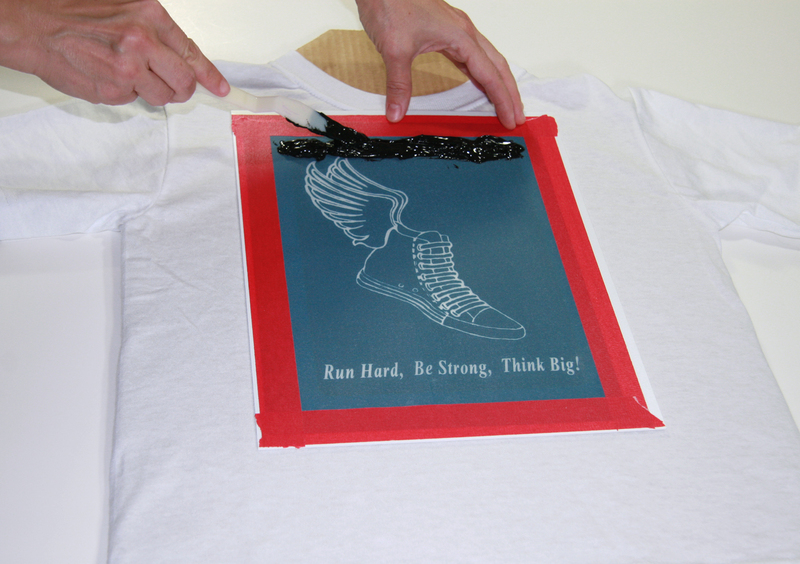 Holding a squeegee at 45 degree angle, I printed the outline of the design onto the t-shirt. 7. Using "Stained By Sharpie" Fabric Markers, I inked in the color. Tip: practice by printing your design on regular printer paper and filling in the colors as desired first if you are worried about messing up or free hand if you feel inspired! And here is yours truly working late at night on the final design..
Heart shaped watermelon bites - what could be more delicious than that? 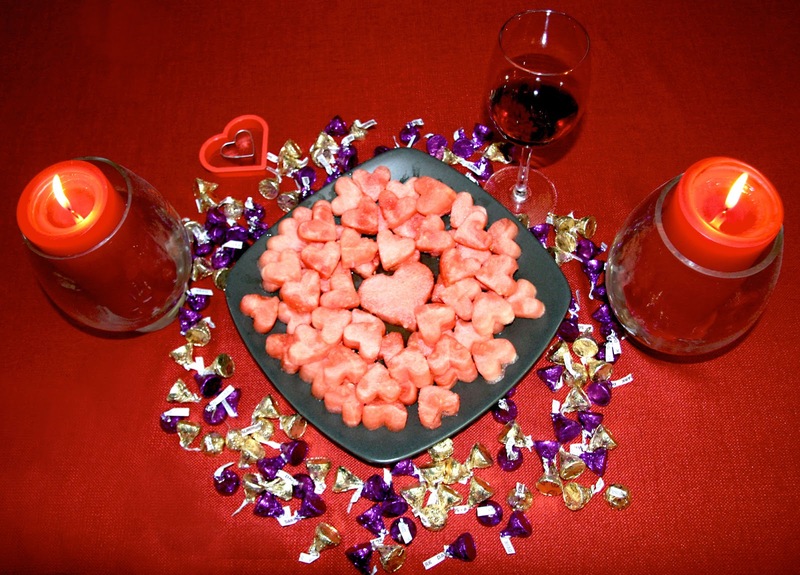 A healthy alternative to the sugary treats on Valentine's day or any other day when you feel like sharing your creativity and imagination. Fill that someone special's heart with good taste and freshness as a bite of watermelon in your mouth. 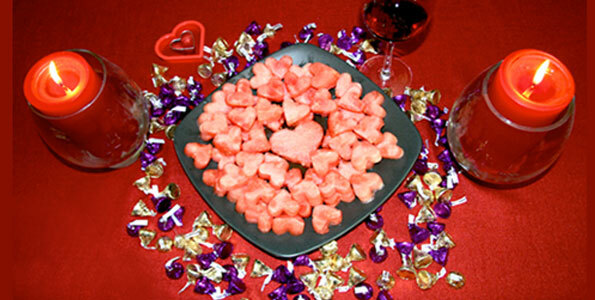 Making these watermelon hearts is simple and quick with little or no chef expertise required.! All you need is a watermelon and a couple of heart shaped cookie cutters of varied sizes. Arrange on a dish and add some finishing touches. A wonderful way to win anyone's heart is to make them a special meal. Therefore, think outside the candy box and enjoy! 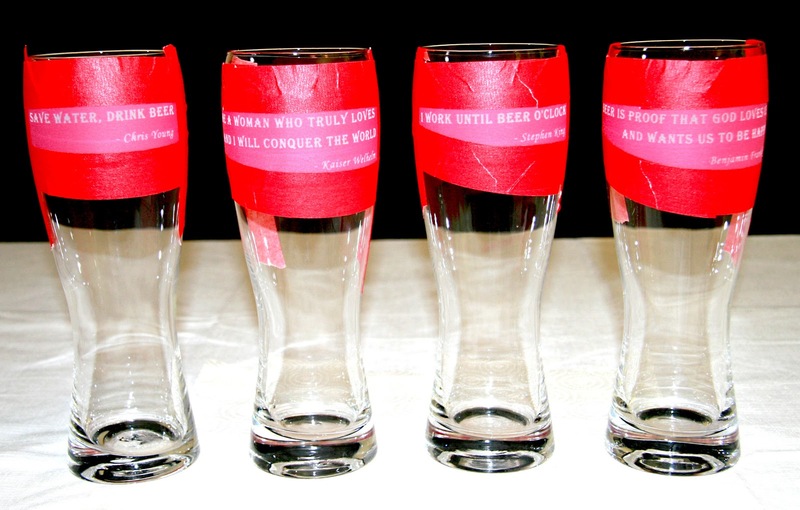 These would make a great gift for 'him' for a Valentine's day, a Father's day gift, or a birthday present. 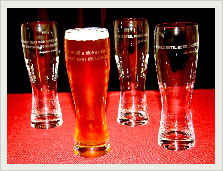 Think personalized wedding bride and groom toasting glasses or a timeless wedding keepsake. 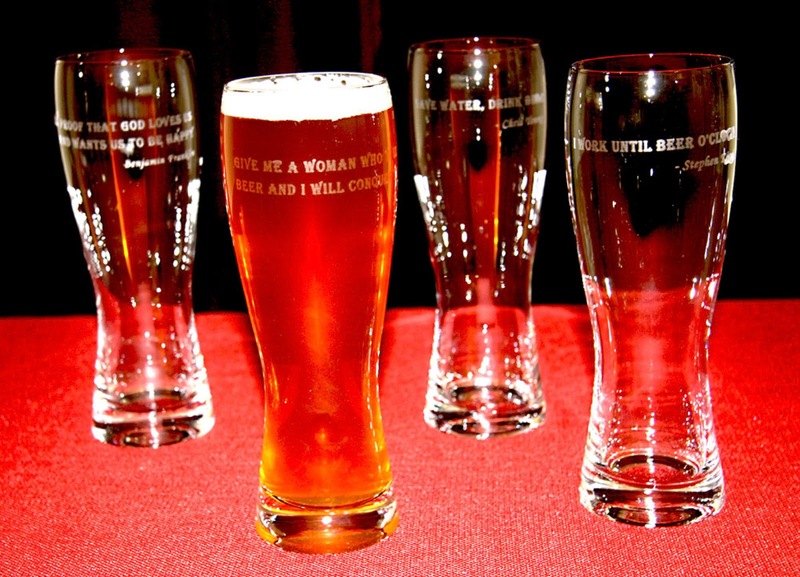 This simple and cheap method of glass etching produces great results. 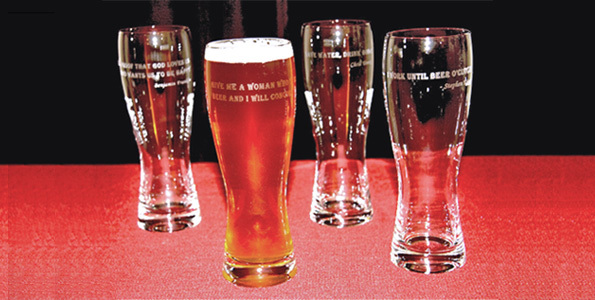 I have decided to use beer quotes by famous people; which I printed on transparency (in black and white), then turned into silk screen stencils using product, called StencilPro. Download artwork I used in this project for free from StencilItPretty Freebies page. Here is the video of the complete step by step glass etching project. Enjoy! I absolutely love, love Candice Olson and her divine design style. She is by far my most favorite interior designer on HGTV. Her classic, sophisticated, and awe-inspiring transformations are truly timeless and moving. She can glam up any space, and do it all with a lighthearted, quirky sense of humor and grace. I am glued to the TV whenever her shows are on. My “Design inspiration” binder is full of pictures of her room makeovers (Candice has recently added a new show, “Candice TellsAll”, to her HGTV design portfolio). Therefore, it is no wonder that when it comes to my own house, I dream up designs which are no doubt, inspired by the queen of interior design herself. With that said; my spaces are decorated with my family’s lifestyle and aesthetics in mind and injected with my own personality. When I decided to remake my family room in a monochromatic warm grey, I knew that I absolutely had to have a pop of color. My new couch was grey, my walls were painted in various shades of grey, and even my curtains were a shimmery shade of grey silk. I love photography and take a lot of pictures whenever I go on vacations. This way, when I come back to all the hustle and bustle of my busy life, I could always have a reminder of that wonderful care-free happiness that I have experienced during my travels; this time I wanted to incorporate the pictures I took during our vacation in Monterey, California. This is how the idea of pictures on the canvases was born. 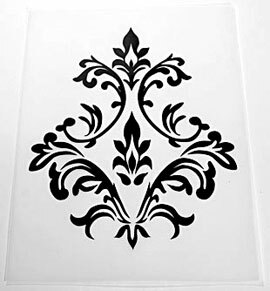 I have come up with a stencil design which speaks to the traditional style of damask wallpaper; yet reinterpreted in a stylized, modern way for the background that I was going to stencil on my canvas. For the stencil, I used stencil material (film), called StencilPro, designed and manufactured by Circuit Bridge (you can find it here). 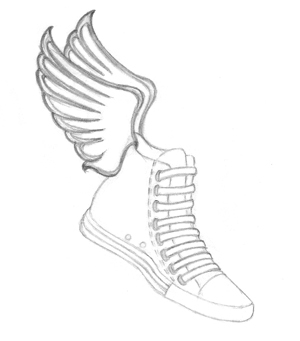 You can download the artwork for this stencil in my Freebies section. 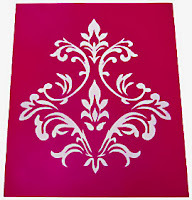 StencilPro is non-toxic, requires only sunlight or fluorescent light and tap water to develop (the entire process takes about 15 minutes); yet you get truly amazing professional silk screen stencils; which would cost hundreds of dollars to make at a professional silk screening shop. I printed the design on InkJet transparency sheet. It is important to mention here that you need a truly black and white image for this process to work. 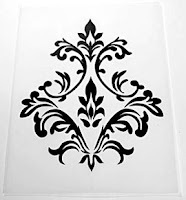 Anything other than black and white will yield less than desired results, and may even waste the stencil because of improper exposure – it will simply not wash out or come off right away with water. I created the stencil by exposing StencilPro and my artwork to light using ContactFrame. 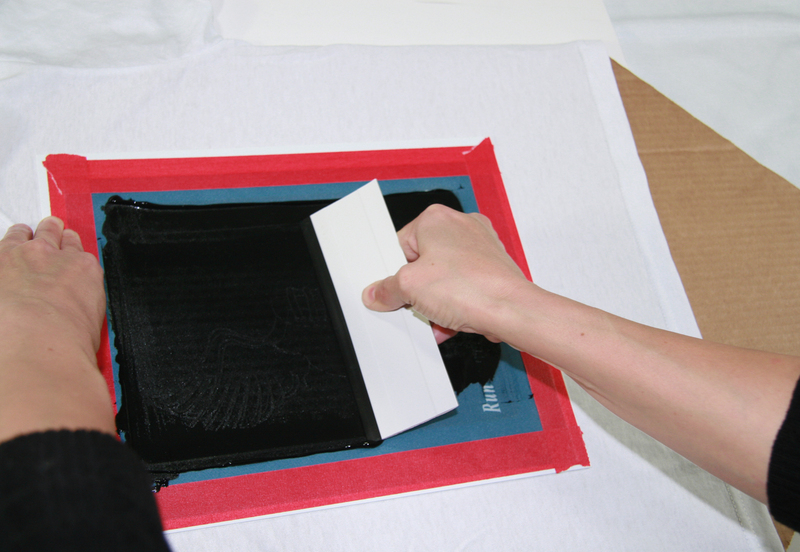 StencilProstarter kit comes with a contact frame and opaque wash out box; which make the entire process pretty easy. When all three canvases were screen printed with my design; I left them out to dry for 48 hours before proceeding with the rest of the steps. 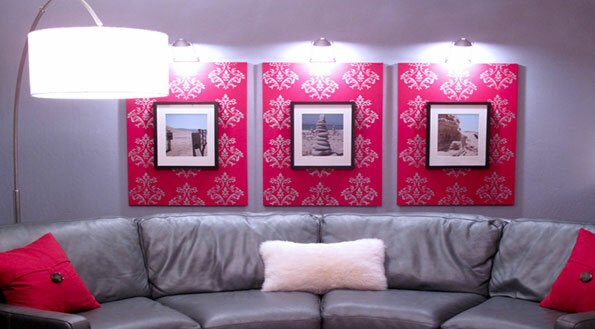 Use flush mount to mount fence boards, canvas and frames. Mount picture light. 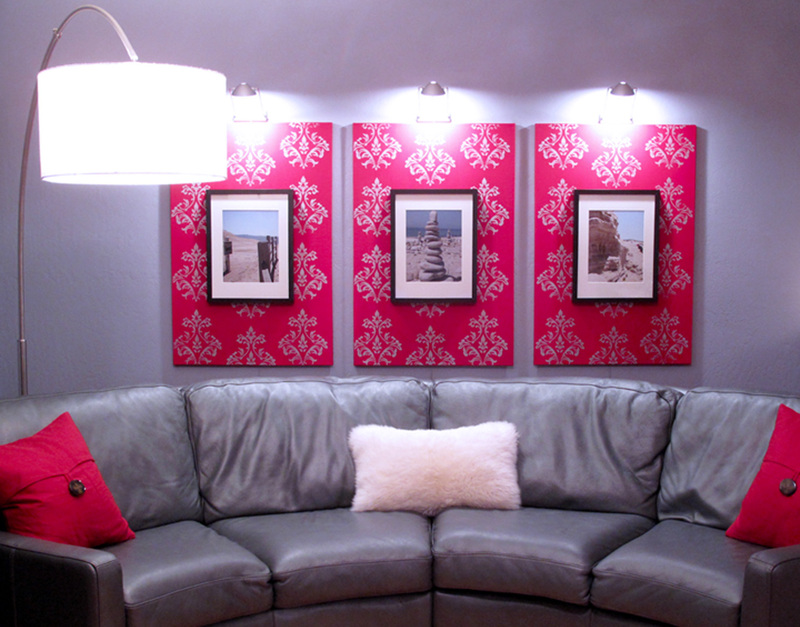 Flush mounting is great for keeping canvas and picture frames tight against the surface. It also allows for easy picture replacement in the frames (I purchased mine from IKEA). 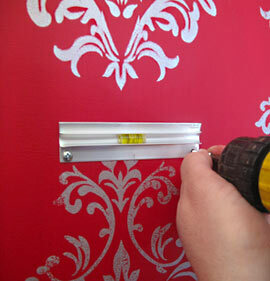 The flush mount I used incorporates removable bubble level; which makes it easy to align canvas on the wall. I measured and marked the center of the back frame on the canvas and flush mount for proper alignment. Then I marked the position and attached the other part of interlocking Flush Mount bracket to the wall. I marked the positions for the molly bolt anchors on the wall, measuring so that the canvas mount aligns with the center between the marks. 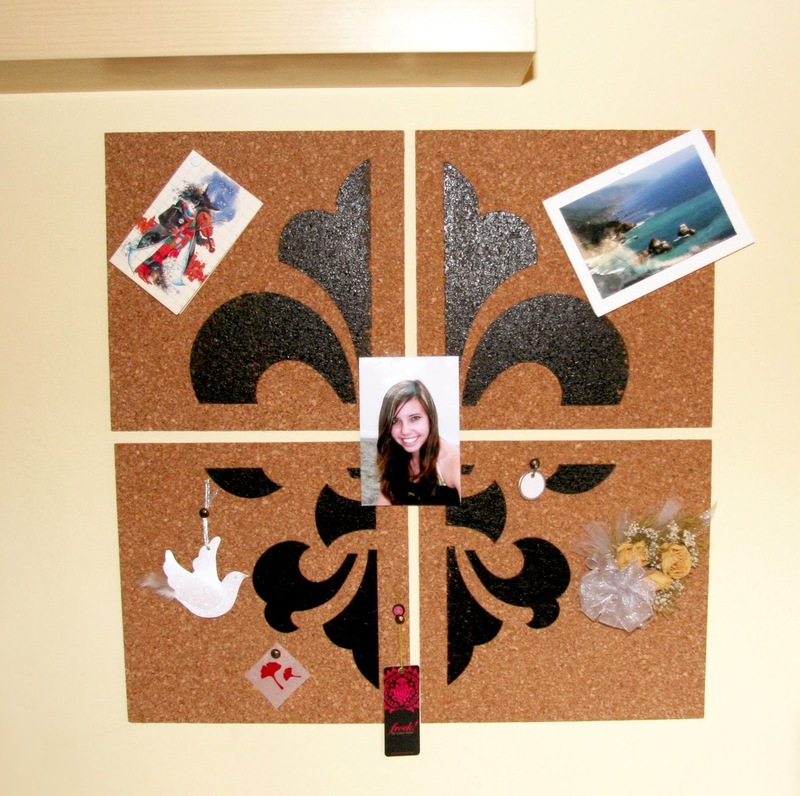 This is where the picture frame would later attach to the wall through canvas and board. Using a power drill, I drilled a pilot hole in the marked spot big enough for the screw. I have used standard 1" thick redwood fence board; which I cut into 8" pieces and primed with wood primer prior to use as filler in between canvas and the wall. Using power drill and Molly bolts or screws, I attached 1" x 8" primed wood board. I measured and mounted picture light (I purchased mine from IKEA) on the wall directly above where the canvas would hang. I used cable tacks to guide and attach picture light's cable on the wall. I also painted bottom of the electrical cord with paint matching the wall color. I measured and attached flush mount bracket to the wood board through the canvas. Then attached matching flush bracket to the back of the picture frame, making sure it was centered. 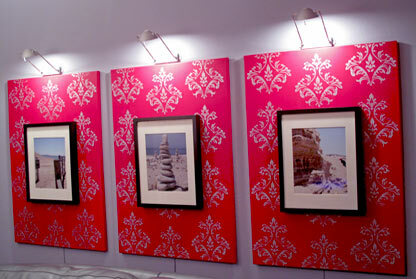 Finally, I inserted pictures into the picture frames and hung picture frames on canvas by interlocking brackets of the flush mount on the back of the frame and wood/canvas. For convenience, I plugged all three picture lights into power strip. I can’t help but smile every time I look at my feature canvas wall. 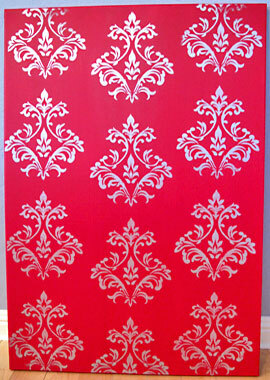 Red background is definitely a bold statement; metallics in the stenciled design add glamour and excitement. The pictures in the frames are a constant reminder of good times. All in one, it captures the spirit of family, friends, fun, and a promise of more great things to come! 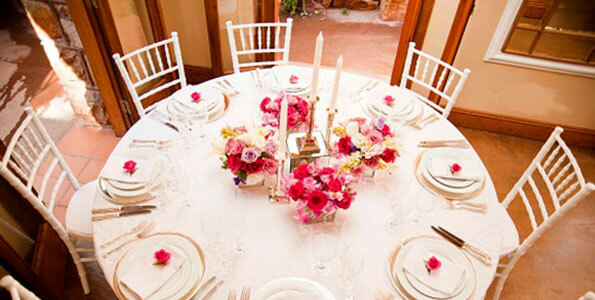 How do you incorporate your personal style in your design? What are your design tools? What inspires you? Stencil It Pretty is all about inspiration and lifestyle. I love DIY, craft, fashion, and design. By sharing with you what inspires me I hope you get inspired, too.